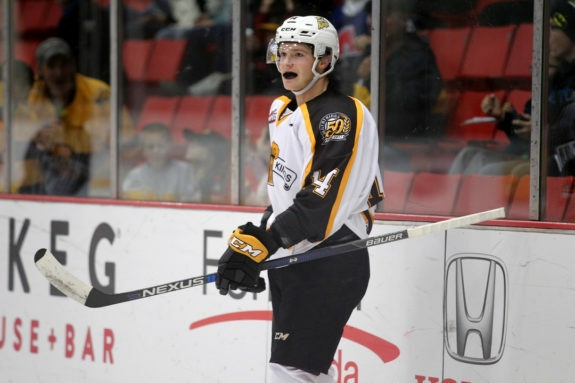 Yet another second year draft eligible player in the 2017 class, Brandon Wheat Kings forward Ty Lewis has seen his stock rise considerably since going undrafted (and unranked) last year. While his first draft eligible season was derailed by injury, he performed fairly well in limited action. But a combination of a larger sample size and the opportunity for an increased role due to some injuries to teammates have given Lewis a larger canvas to work on. Now the 59th ranked North American skater by Central Scouting, Lewis has dramatically raised his stock in the eyes of scouts. The key to Lewis’ success this past season can likely be described in one word: consistency. Only two players played more games for Brandon and only one player, overager Reid Duke, had more points for the Wheaties. Lewis played a ton, largely avoided injury, and played very solid hockey for the balance of the season. When his highly touted teammates like Duke and presumptive first overall NHL pick Nolan Patrick missed time with injury, Lewis received additional ice time and opportunity on the power play. Impressively, Lewis led the Wheat Kings in power play points and game-winning goals. For a team that didn’t score a ton – of the WHL’s 16 playoff teams, only the Calgary Hitmen scored fewer goals – Lewis’ contributions to the Wheaties’ ninth-ranked power play were invaluable. A rock-solid 200-foot player who can contribute in all three zones effectively, the additional space afforded to him on the power play allowed him to take the time to make nifty passes and create offense. If there’s a criticism of Lewis’ game, it’s that he needs to do more at even strength. Much of his offensive production was on special teams and while he wasn’t a liability at five on five, he wasn’t nearly as noticeable as he was on the power play. If he’s going to cement himself as an NHL prospect going forward, he’ll need to keep developing his game and become more than just a solid all-around player who can create situational offense. Hopefully, his play this season at crunch time, reflected in his team lead in game-winning goals, can be built upon going forward. Lewis seems a good bet to go somewhere between the fourth and sixth rounds. “He has quick instincts and can pounce on a loose puck or get his feet moving fast on his first three strides. The way he is able to get a wrist shot off is super impressive. He has shown that there is upside and a solid offensive skill set to build upon. The way he forechecks is impressive as well and often shows off his work ethic and quick stride to badger the defence.” – Joel Henderson, Dobber Prospects. Bottom six forward with offensive upside. Lewis has yet to win any major awards or participate in any major international events.